dissipation under cyclic loading. More importantly, once the shear reinforcement yields, the resistance degrades fast with cycling, leading to failure at relatively low deformations. So, this mechanism does not lend itself to ductile inelastic behaviour, and should be constrained in the elastic range. This is achieved by dimensioning concrete members in shear, not for their force demands from the analysis but for the maximum shear forces that may physically develop in them. This maximum value of the shear force is computed by expressing (through equilibrium) the shear force in terms of the bending moments at the nearest sections where plastic hinges may form and assuming that these bending moments are equal to the corresponding flexural capacities. 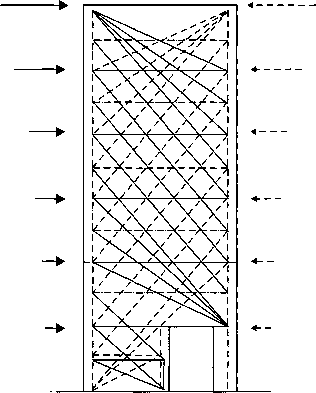 As the bending moment in these sections cannot physically exceed the capacity in flexure, including the effect of strain hardening, the so-computed shear force is the maximum possible. Once dimensioned for this design force, a member will remain elastic in shear until and after the development of plastic hinges in the sections that affect the value of the shear force.